Hello there, today starts the sneak peeks for the July release from Clearly Besotted. As always, myself, Stephanie, the rest of the DT and our amazing guests Jo Nevill and Cindy Lovell, will be sharing teasers with you from now until 5th July when the sets will be released. For my teaser today I am using the new Magnolia Blooms set. 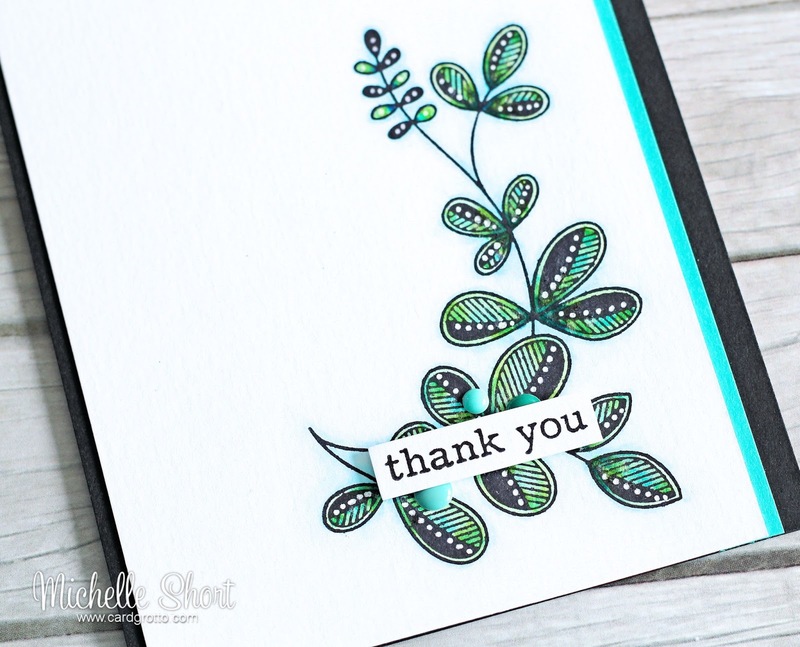 I started off by stamping the leaves image on to some TH watercolour cardstock, using Hero Arts black ink. I then coloured the image using Zig Clean Color Real Brush Pens, a paintbrush and some water. Once dried, I added white dots to the leaves using a Gelly Roll pen. This panel was adhered to a black A2 card base, along with a strip of Bazzill Candy Necklace, with ATG. I stamped the sentiment, from the Sentimental Type set, on to more watercolour cardstock (so that the cardstocks match), cut this out and adhered to the card with foam tape. I finished off by adding a few enamel dots. ZIG CLEAN COLOR REAL BRUSH PENS: 45 Pale Green, 41 Light Green, 42 Turquoise Green, 31 Cobalt Blue, 30 Blue, 36 Light Blue. Thank you so much for visiting me today. Please pop over and see Stephanie, who will have some amazing samples to share, along with links to all the DT sharing today. It is both a sad and a happy month for us at Clearly Besotted. Sadly our amazing DT member and friend Caryn Davies is stepping down from the team. She will be sorely missed, however, I know we will all still keep in touch and I wish her all the best in her new journey. Now for the good news, the amazing Lucy Abrams will be joining the DT, yay! See you tomorrow! I love the clean and simple look of this card... it has great impact! Fabulous,Michelle!! What a great way,using this beautiful Set! Pretty colors!!! So pretty! And I love the white dot details you added!